Cover Description: Ice kneels, cradling Superman's cape. Behind her stand, from left to right, Booster Gold holding an unconscious Blue Beetle, Guy Gardner, Maxima, and Bloodwynd II. This cover has a paper overlay advertising the "Death of Superman" aftermath that obscures Booster Gold and Blue Beetle. Brief Synopsis: The Justice League past and present come to terms with the death of Superman. Issue Notes: This issue falls under the "Funeral for a Friend" storyline running throughout the comic book titles featuring Superman. The story details the events immediately following Superman's death. Booster Gold and Maxima receive the news that Superman has died fighting Doomsday, as shown in Superman, Vol. 2, #75. 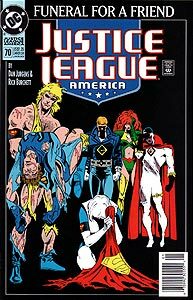 The two Justice Leaguers are in an Ohio hospital, seeing to the emergency medical needs of Blue Beetle II, who was also felled by Doomsday in Justice League America #69. 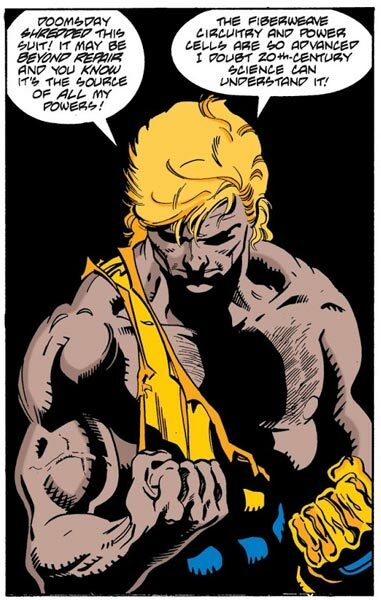 Booster Gold wears the tattered remains of his original Mark I powersuit, destroyed in his fight with Doomsday in Superman, Vol. 2, #74. Booster breaks up a fight between Guy Gardner and Maxima. The fight was started when Guy was typically callous about Superman's demise. Blue Beetle II lies in a hospital bed. Booster Gold, Oberon, and Maxwell Lord listen as the attending physician delivers the bad news that Beetle may never recover from his wounds. Based on the vertical stripe on the red can that Booster is holding, he appears to be drinking a Soder-Cola, the number one soft drink in the DC Universe. As Lord runs through a roll call of the current Leaguers and their injuries, Booster recycles his aluminum can. Despite despairing that his days as a superhero may be over, he still has the moral fortitude to recycle. He's a true hero. Flash III finds Booster on a patio of the Justice League Headquarters beside New York's East River. Booster expresses his feelings of inadequacy and helplessness after the battle with Doomsday. Aquaman arrives, attempting to provide Booster with some perspective and solace. Aquaman himself has lost family (notably his young son) in the fight for truth and justice. Batman and Robin III swing down to join Aquaman, Booster, and Flash. Batman tries to soothe Booster's guilt in his inability to assist Superman by pointing out that "Doomsday had already vanquished you." He's friendly, that Batman. The next to arrive at the impromptu Justice League wake for Superman are an aged Green Lantern I (Alan Scott), Power Girl, Flash I (Jay Garrick), and Elongated Man. In modern DC continuity, both the Flash I and Green Lantern I were chronological precursors to Superman. However in pre-Crisis continuity, both appeared several years after the Man of Steel. Booster is off-panel, and it is unclear if he meets with either venerable hero. At some point during the gathering, Booster has snuck away from the crowd to continue his vigil over the comatose Blue Beetle. Boosterrific Review: While the previous issue was all action, this issue is all emotion. Rather than being a detriment, this change of pace is the issue's strongest asset. This issue is remarkable for its sincerity. It would be all too easy to hit a sour note in a wake for super heroes, the emotions and dialogue expressed all seem genuine, and this reinforces the verisimilitude for the reader. This comic is as satisfying as it is tragic.